Dupo, IL (December 13, 2015) On a uncharacteristically warm December Indy day, 40 of the top dirt drivers from around the country assembled at the Banker’s Life Fieldhouse in downtown Indianapolis. After receiving a late invitation to the first ever Indy Invitational, Kyle Schuett quickly showed why he was one of those 40. As if earning the 2015 POWRi Rookie of the Year honors, finishing fourth in POWRi points, and winning the National Midget Driver of the Year Rookie of the Year award wasn’t enough, last night wrapped up what has truly been an unforgettable 2015 race season for Kyle and his Schuett Racing team. 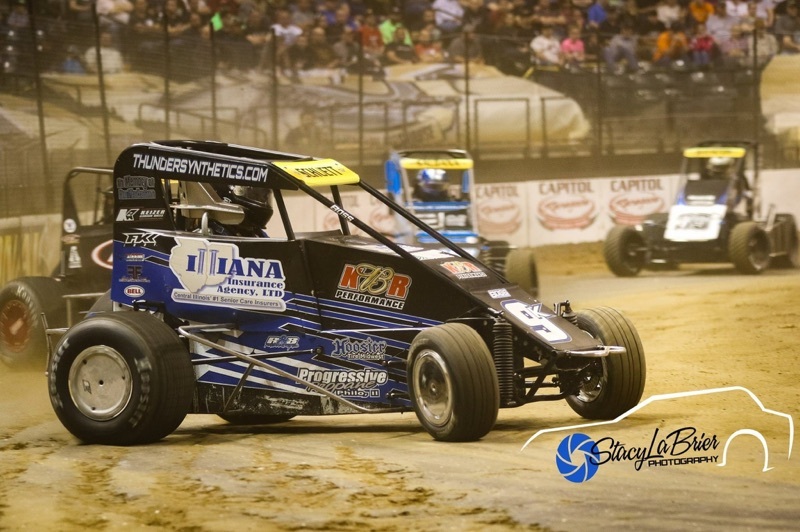 The format for the biggest midget race to hit Indy in a very long time was joint hot laps and qualifying, followed by five – eight car heat races. Heat race winners would be qualified for a dash to determine the starting lineup for the A-main and second place in each heat would also move straight on to the A-main event. Everyone else would be divided into two B-mains, giving them one last chance to make the 30-lap Bad Boy Buggies A-main. In qualifying, Kyle ended up third quick out of the 40 cars. This put him starting on the pole of heat race three. In an event containing names like Cottle, Darland, Clauson, and Shuman, Kyle jumped out front and never looked back. By virtue of his heat race win, Kyle locked himself into the dash and guaranteed his team a top five starting position for the feature. After a revenge draw on the front stretch, Kyle lined up on the outside of row one for the dash. Again getting a great start, Kyle took the early lead and crossed the stripe first to pick up his second win of the night. After a few delays for the Outlaw Kart feature and one to let the dirty air clear out of the building, Kyle and the 18 other A-main cars pushed onto the race track and prepared for driver introductions. On a night where midget racing was being presented on one of the biggest stages of the year, it would have been easy for nerves to get the best of this young rookie driver, but Kyle held his composure and what he did for the next 30 laps was nothing short of amazing. 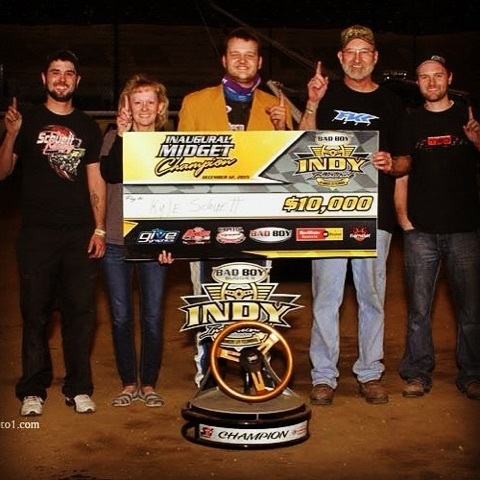 In an event plagued by cautions, Kyle jumped out to an early lead and was able to fend off challenges from behind to lead all 30 laps and win the inaugural Indy Invitational. Not only did he win the biggest race of his young career, it was also his first midget win, and he led every lap of the night to do so. That’s impressive by any standards. Kyle was thankful for his Schuett Racing team, which includes his mom and dad, crew chief Jaryd Chambers, Ebby Bergfield, and Dan Myer. His team gave him a great car all night long and he was able to do what he does best and drive a great handling Esslinger powered Boss Chassis. Schuett Racing would like to thank everyone for the congratulatory calls, texts, messages, and hand shakes. Kyle and his team would also like to thank everyone with Indy Indoors for all of the effort and promotion that went into this event. This race put a lot of small teams and unknown drivers out on a center stage in front of thousands of race fans from across the country and the world. Last but not least, Kyle would like to thank his sponsors that have supported him all year long and made this entire dream come true. 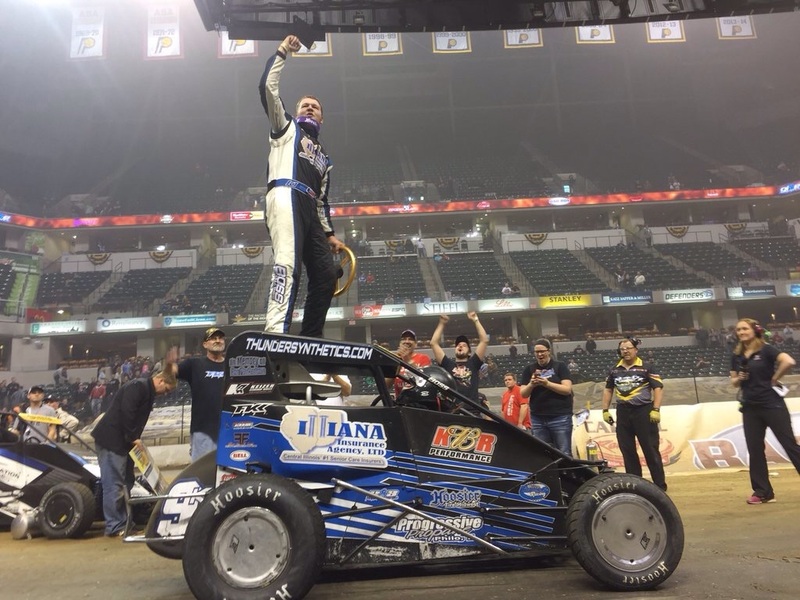 Thank you – Illiana Insurance Agency, Progressive Propane, Bergfield Farms, KBR Performance, Rod End Supply, FK Indy, Hoosier Tire Midwest, AMSOIL by Roger Clapp, Steve Thomas Racing, Bell Racing, ButlerBuilt Professional Seat Systems, BOSS Chassis, R & B Powdercoating, J & K Rentals, and Keizer Wheels.